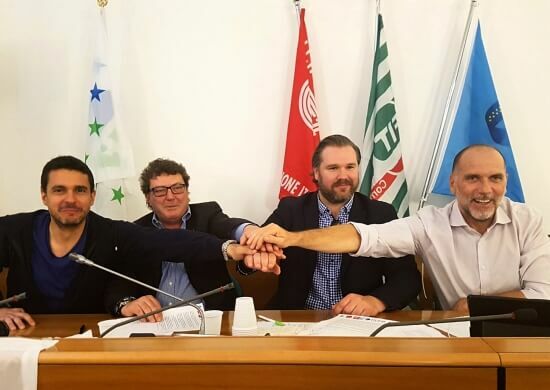 ETF affiliate unions from Italy and Germany have met in Rome to start working together for all workers at Eurokai – the largest European-owned container terminal operator. German union ver.di and the Italian unions FILT-CGIL, FIT-CISL and UILTRASPORTI signed an agreement to support each other in their collective bargaining and possible disputes. They pledged to fight together for good working conditions, the protection of lashing jobs for dockers, and a strong voice for unions in any introduction of automated technologies. Through its subsidiaries Eurogate and Contship, Eurokai is the biggest European-owned container terminal operator and has a significant presence in German and Italian ports and logistics. For this reason, and also taking into account the recent expansion of the company both in Europe and overseas, it has been identified by the ETF Dockers’ Section as a priority company where transnational trade union cooperation should be developed. Alongside our mission to get Eurokai to recognise unions and consult them on any new technologies, ETF will also start talks towards the establishment of a European Works Council (EWC). This body, mandated by EU law, would bring together unions from all countries that represent workers in Eurokai Group companies. Read the full declaration (pdf in IT, DE, EN) adopted on 8 May 2018. Read more about European Works Councils.